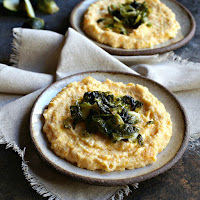 I've been on a serious polenta kick around here lately. I think it's a combination of chilly weather and busyness. Polenta is a big warm bowl of comfort and it's also easy to make and cooks pretty fast. And, for even more fun, it's wonderfully versatile so I can change up the flavors and not get bored. It started a couple of weeks ago when I had some leftover beef stew but no more potatoes. So I ate the last of the stew over a bowl of buttery polenta and wondered why I hadn't eaten more of the stew that way. Next up came some leftover meatballs but no more spaghetti. 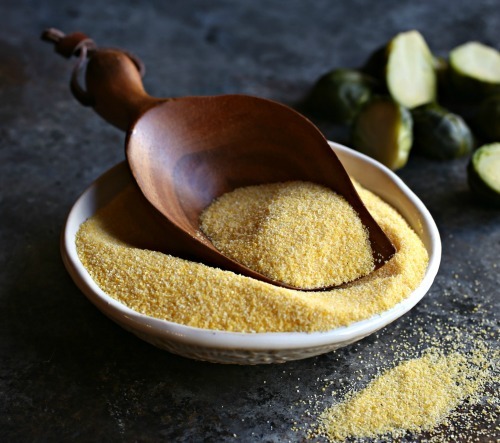 Yup, polenta to the rescue with some grated Parmesan. I usually add some milk to my polenta to make it extra creamy so I started to think that ricotta would make a great addition. Butternut squash is pretty much my autumn obsession and the sweetness was a great foil to the slight bitterness of Brussels sprouts. Likewise, the crispy sprouts were perfect with the creaminess of the polenta. 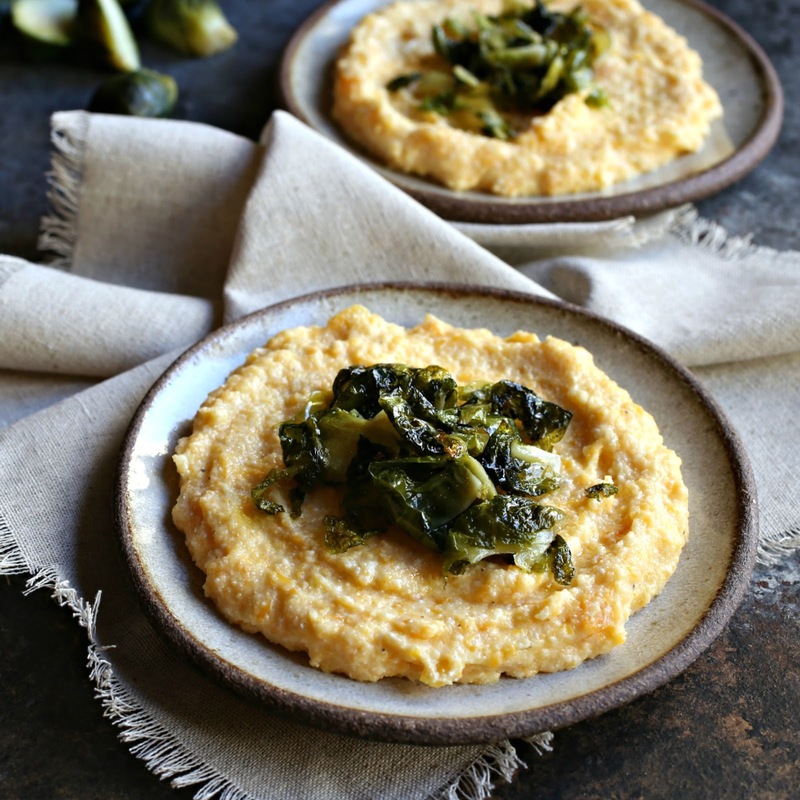 Overall, this side dish goes with just about everything and I sure wouldn't mind seeing it on a Thanksgiving table. Enjoy! Place the squash in a microwave safe bowl and cook on high, in 2 minute intervals, until the squash is completely soft. Mash it with a potato masher. Place the Brussels sprouts in a pot of boiling, salted water and cook for about 5 minutes or until they can be pierced with the tip of a knife. Drain and set aside to cool. Add the polenta and water to a pot on low heat and stir often for about 15 minutes. The polenta should be fairly thick and creamy. Stir in the mashed butternut squash and butter. Stir in the ricotta cheese, season with salt and pepper and remove from the heat. 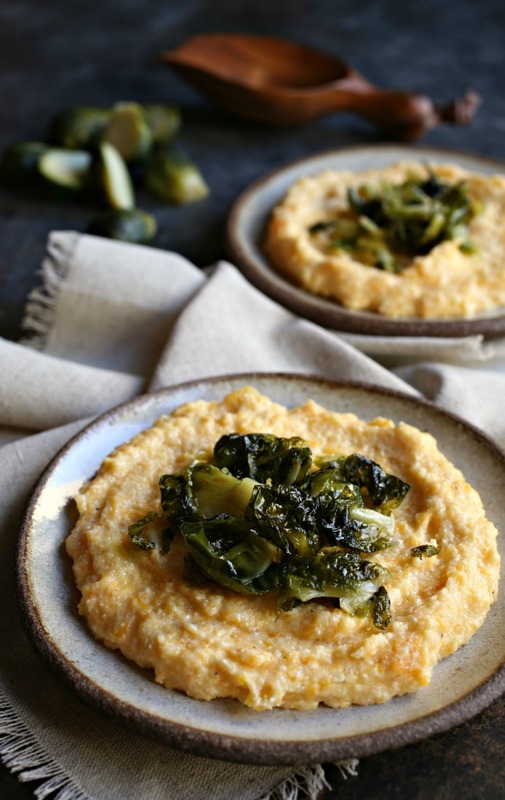 While the polenta is cooking, slice the tips off the cooked sprouts and peel off as many of the leaves as easily come off. Add the olive oil to a large skillet and toss in the sprout leaves and small remaining pieces. Saute for a few minutes until slightly crispy and drain on a paper towel. Season with salt and pepper. 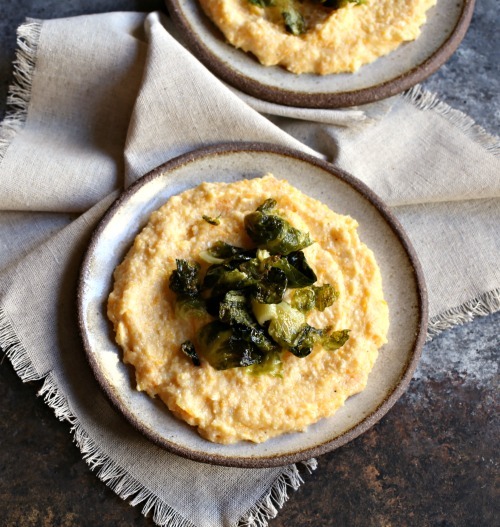 Spoon the cooked polenta onto a serving dish and top with the crispy sprouts.